Since the early 1980's I've planted and overseeded thousands of fescue grass lawns. One of the most important things to consider when establishing a fescue lawn is choosing the type and variety. When planting a new fescue lawn, you'll want to choose a variety of fescue grass that performs well in your area. I don't usually recommend Kentucky 31 Fescue because it requires a higher mowing height and is best suited for use in pastures. Instead, I always recommend a turf-type fescue. Whether seeding a new lawn or overseeding an existing lawn, I've had very good success here in central Georgia with Titan Turf Type Fescue, but there are many varieties available on the market. When overseeding a Fescue lawn, it is not absolutely necessary to overseed with the same variety or name brand of seed that was used when your lawn was originally planted. Often, the variety you first planted may no longer be available. So, if you can't find the type you want, consult with your local independent nursery and garden center to see what available varieties of turf-type fescue perform best in your area. Fescue seed is best planted in early to mid fall. This allows the seedlings to establish themselves before winter and then benefit from the spring root flush. The more extensive the root system is before summer, the less watering and more restistant to drought your lawn will be. If you missed the fall planting season, the second best time to plant a fescue lawn is in early spring. If your fescue lawn looks nice and green, but has thinnned a little over summer due to heat, chances are your soil pH is fine. On the other hand, if your fescue grass looks light green or yellowish you might want to test the soil pH. Rather than go into the details here, you can check out my article on soil pH and how to adjust it. If you are planting a new lawn from scratch I would heavily recommend testing soil pH with a soil testing kit. Whether planting a new lawn or overseeding, if your soil is dense or compacted, to improve the soil, you might consider using soil amendments such as compost, sand or other soil conditioners applied to the surface of the soil. When planting a new lawn you'll want to till these amendments into the soil. Mow Turf If overseeding, mow existing turf to under 2 inches in height. This will allow seedlings time to mature before the lawn needs mowing. 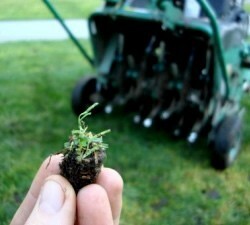 When overseeding a lawn, you'll be using an aerator to poke holes in the soil. Aerators penetrate the soil best when the soil has been moistened by rain or watering. If the soil is hard and dry in the area you intend to overseed, water the area deeply during the evening on the day before you plan to aerate. This will soften the soil so that the aerator does a better job of pulling deeper plugs. Keep in mind that if the soil is too wet, the pluggers on the aerator may become clogged and not work properly. Before broadcasting seed over your lawn, aeration of or tilling the soil is highly recommended. Aeration allows seeds to drop in holes where plugs have been removed, reducing the possibility of washing and facilitating stronger root growth of seedlings. Aeration also allows fertilizer or organic matter applied to get to the roots and water to soak better into the soil. When overseeding a fescue lawn it is best to use a mechanical "core-type" power aerator that will remove and disperse soil plugs (2 to 3" in length) randomly atop the ground. Core-type power aerators can be rented from your local tool rental store. Make at least two, or as many passes as desired, over the area to be reseeded. 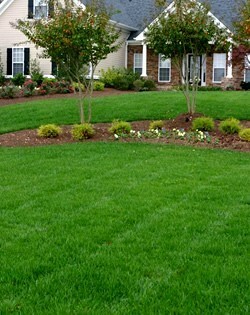 When planting a new lawn from scratch, you'll need to till the soil to a depth of at least 6 inches, then raking smooth. If you choose a turf-type fescue seed, which is what I highly recommend, you'll want to broadcast the seed at 2 to 8 pounds per 1,000 square feet of area, depending on whether your planting a new lawn or on the density of your existing grass after summer. For example, if you're starting a new lawn from scratch you'd want to spread the seed at a rate of 8 pounds per 1,000 square feet of lawn area. On an existing lawn, if you lost 50% of the lawn grass over summer you'll want to spread about 4 pounds of seed per 1,000 sqaure feet of lawn area. If you lost only 25% of the lawn grass over the summer, you might need only spread about 2 pounds per 1,000 square feet of lawn area. If you're lawn is still full and lush you don't need to overseed. Too much grass and roots will compete for space, resulting inj die-out or requiring extra irrigation to support the plants. 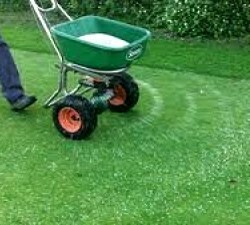 After aerating or preparing the seed bed, broadcast the seed over the the lawn area. Broadcasting the seed first allows you to actually see where the seed is falling on the ground, ensuring even distribution and coverage. Using a walk-behind rotary spreader, or shoulder spreader, start by broadcasting a band of seed around of the perimeter of the area to be sowed. Then make two passes over the interior lawn area. Make the passes in opposite directions to ensure good coverage. Spread a little extra seed in bare spots. After broadcasting seed, you'll want to apply a "starter-type" lawn fertilizer with a high-phosphorus content (the middle number). Follow instructions on bag for application rates. If you tested for soil pH and results showed you need to apply lime to "sweeten" the soil do so after broadcasting fertilizer. I recommend using a fast-acting limestone product such as 'LimeRite', which covers 5 to 6 times the area as standard pelletized limestone. Finally, follow up by applying a thin coat (just enough to cover the soil) of wheatstraw or hay to bare areas. This mulch coating will help retain moisture necessary to facilitate quicker germination of seed. Additionally, it will help prevent washing of seed in the event of heavy rainfall. The most critical need of seedlings is water. Before seeds have germinated, and in the absence of rainfall, you'll want to provide enough water to keep the soil damp or moist, but not constantly soggy or wet. If the soil is allowed to dry out, the seedlings won't germinate or will soon wither and die. To maximize the germination rate, soak your lawn on the same day you sow the seeds. Thereafter, be sure you to apply enough water to moisten the soil to a depth of one inch. Keep the overseeded lawn moist until the young grass plants are 2 inches tall by repeating a light watering every day after periods without rain. When the grass is 2 inches tall, resume normal watering patterns. Wait to mow until seedlings have reached a heioght of 5 inches or so. At that time, mow grass to a height of 3.5 to 4 inches. Never remove more than 1/3 the height of the grass during a mowing.